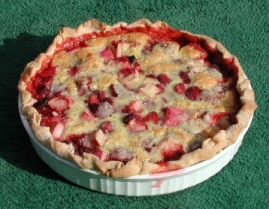 Combine rhubarb and strawberries and place in 9-inch pie shell. In another bowl, combine sugar, flour and nutmeg and mix well. Cut in butter and beat in eggs. Pour this mixture over fruit. Optional: Arrange a lattice crust on top of pie. Place in an oven preheated to 400º F then lower temperature to 350ºF and bake for 1 hour or until pastry is done.